Middlesex University Law students have been treated to a fascinating insight into the workings of the European Court of Human Rights (ECtHR). At a special screening in the College Building, the students were able to watch minute-by-minute footage from the 'Tagayeva and Others v. Russia' hearing from Strasbourg, in which the European Human Rights Advocacy Centre (EHRAC) played a leading role. The chamber hearing, which had been recorded earlier in the day (14 October 2014), concerned whether Russian forces had violated the European Convention on Human Rights when they stormed Beslan's School No. 1 on 3 September 2004 in an attempt to reclaim it from Chechen separatists – who had taken more than 1,000 children and adults hostage – resulting in hundreds of deaths. After watching the Russian government put across its version of what happened on that tragic day to the Court, the students listened as Jessica Gavron, Senior Lawyer for EHRAC, addressed three questions put to her and the other representatives of the 447 applicants. 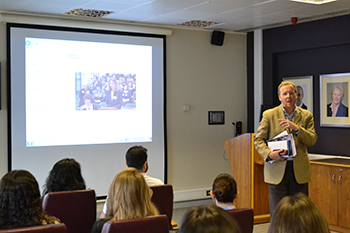 On hand to explain the proceedings and answer students' questions was EHRAC Director Professor Philip Leach. He informed students of EHRAC's role as a partner to NGOs in Russia, how the judges are selected for the ECtHR and what will happen following the brief hearing, during which Jessica and her counterpart had only 45 minutes each in which to present their arguments. Professor Leach also invited any students interested in learning more about human rights law to apply for an EHRAC internship. The Beslan hearing came just three weeks after EHRAC was involved in a rare Grand Chamber hearing in the case of 'Zakharov v Russia' concerning phone surveillance by the security services and less than a week after it helped secure a judgment in the case of 'Amerkhanov v Russia'. Dzayanu Amerkhanov's son Rustam disappeared in November 2002 after being detained by Russian forces in Chechnya. Almost 12 years later, on 9 October 2014, the ECtHR ordered Russia to pay her €60,000 in damages.